Can't see the forest for the trees!!! Here is where I am at in the process...the second quilt from the Leaders and Enders book by Bonnie Hunter. I think a blog friend is sending me some blocks...so I am holding on for those...how fun to include blocks from a friend! All the setting fabric is from the stash...I already had cut the sashing for another project that never came to fruition, so that was great! I do not have enough of these little squares for the border...will I have to (perish the thought)...actually have to cut some? I have been trying to empty my scrap drawers as some of you know.I like the combination of green, red and gold...looks kind of like Holland a little to me. 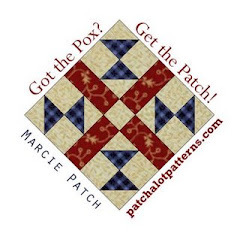 I found this pattern in the Nov/Dec issue of McCall's quilting...I like this idea for my nine patches! It is a definite possibility...I like the play of medium and light fabric. Pretty!! I find that I buy quilt magazines and usually find about one project per magazine that I love. These 1.5 inch squares are part of a recent swap I was fortunate enough to take part in....so you know what that means?? I can make more of these blocks!! Yippee! I have almost all the tree bases paper pieced, and that is just fun. The fact that I have them done is fun...not the paper piecing necessarily... I find I waste a ton of fabric while paper piecing...do you? How can I get better at this?? These blocks are part of Cheryl's quilt along...I love these autumn colors! I am considering how to set them...probably different from anyone else...now that's no surprise, I am sure, to anyone!! I have been working a lot, and back to it again tomorrow...hardly a chance to breath! So on to the rest of the housekeeping and laundry, so I can be ready for this busy week. Plugging away until I finally get it done!!! And....the top is a top! Altogether now, I mean! I feel a particular triumph about getting a huge quilt top in one piece...do you? Just a moment of satisfaction, of wow, I did it!! Over 2200 pieces in this quilt top, almost every two inch square I have ever cut and saved is in here, saved over many, many years. I am delighted!! My living room (oh, I mean design floor) is almost too small to show this one...king sized, I think...around 100x108 inches. Is that queen sized,maybe? Anyway, big for me. Keep in mind, any threads you see are imaginary...do you know what quilt I am making out of the 1.5 inch scrap box?? It's what's cookin'! and a surprise! this quilt that Lyn made also! I kept hanging on to them, hoping I would finish another top and send it, but I think I just need to pass these all on to Mary, so the quilts can get to who needs them most. The big meeting about work finally came...and I will have a job. That is good! I just have to decide whether I will continue to be a heart nurse, or be a med/surg ICU nurse. I want those heart patients...but we will just have to see what happens and which way the wind blows. More questions than answers arose in the meeting...administration is playing it close to the chest about benefits and stuff with the new Heart venture...so we are all waiting and seeing!!! Everyone...hope you have a most wonderful week!! The family that lived in our home before us left behind a large washtub, so I plant something in the tub each spring. This year, I planted coleus...and it has now really gotten big! I usually trim it back, but with the first frost it will be gone, so I am just kind of letting it go...pretty! Here is a fall time treat for me...in our back yard, these lovely flowers are still hanging on! My husband trimmed them back pretty severely, and that seemed to really help them. It was fun to go out and discover their lovely blooms! I am so delighted and grateful that all the miners were pulled out OK, from the earth, in Chile...so happy for their families!!! And, I heard from a couple people that they got their nine patches~! I am so happy about that...yahoo! And the winner of the Fall into Fall giveaway! by random draw...is Amelia! Please send me your address and I will send you your gift! 1800's reproductions...1930's prints...batics...plaids...solids...every print imaginable...and even a few precious squares that my mother cut with pinking shears in the 1960's....it is all in here! Every two inch square I own is in this quilt...12 squares were left over, and they will go back into the 2 inch bin, and I will collect them again! This is one humongous quilt, ladies...and I have a bunch of blocks left over...should I make the quilt super huge, or make another quilt altogether? Leftover blocks.....about two dozen left over. A couple in our neighborhood was having a garage sale this past Friday....and we walked by...and I spied plaid shirts! These are all size XL...he apparently had gone on a diet and lost weight, and was selling his shirts. 50 cents each...now really, who could resist that?? I am watching the Chilean miners getting rescued on the news....I was tearful and so anxious about them getting out alive last night, I can just imagine how their families feel! I can just imagine my dear husband or son down there...crazy-making for sure!!! I am praying for them all to get out just fine...and wouldn't it be unnerving to be the very last one out?? Well, this is not much of a picture...but that is where I am at! In the process of making scrappy Irish Chain blocks...It started out as a leader and ender project, but quickly turned out to be the main event! So, I am making one billion little squares into blocks. Fun! The blue strips behind the bunch of squares is the beginning of my Blue Ridge Beauty quilt, so that one is next up!! Maybe that is...I am fickle...to my own planning!! The last of the nine patches for the swap arrived Saturday night...so I quickly divided them up into the packages, and then realized...the post office is closed on Sunday. So today, I scurried over to the post office...which was closed for Columbus day! Except the self serve center...so I sent out tons of nine patches today! Please look for my e-mail if you are a swapper and let me know if you have any problems whatsoever! I am hoping for Joy for everyone!! Have a nice day, y'all!! You know, I am not a Texan...but I talk like one now! Wow, who knew?? Hi Y'all!! First Friday's of the month....I love those days, for that is when Kaaren of the Painted Quilt posts her first Friday freebies...I have made almost every one, and printed those I have not done yet. This is her pattern, above, for Halloween...I used wool on a cotton dish towel. 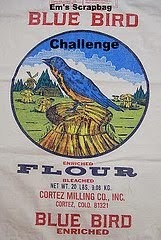 I did not really have an appropriate background, so the dishtowel was pressed into service. I am not going to USE it as a dishtowel, however...The stitchery is not done yet, nor the pieces sewn down...I will do that on an insomnia night. You will love her designs...please go and visit Kaaren! Another person to go and visit is Darcie! It is her birthday today! She is just the most wonderful longarm quilter in the world...won't you go over and wish her happiest birthday?? Just click on her name!! Ok...this old rickety chair is a pretty constant companion to me. It usually holds all my quilt pieces and parts as I sew at the kitchen table. You can see, Rosie is resting on her bed with her quilt and blanket on the right. Hard life, you know. All these 2 inch squares are from my 2 inch scrap drawer. I just got some of these drawers cleaned out and was feeling rather smug...when I just realized...that as long as I am a quilter and cutting all my little pieces into these drawers, I will never be truly done with these drawers. Isn't that what it is all about...an AHAH! moment for me. See Bonnie Hunter's leaders and enders book with the squares? I am making three quilts from this book! All from my scrap drawers! Ok, first are the "twosies". See if you can guess what I am making...without peeking. Then are the twosies sewn to purple centers...I like purple...pretty!! Scrappy!! Hmmm....look like alternate blocks, right? I got all 66 of these done...yahoo! All out of the 2 inch scrap drawer! And of course the white polka dot was from the stash...pretty old is all I can say about that! Hmmm....purple center, and more 2 inch blocks pieces...what in the world?? I bet you have guessed by now!! Scrappy Happy Irish Chain!! So, I am working on putting the 25 square blocks together now. Now, this is not exactly like Bonnies's in the book...I am doing it a little different, but the concept is the same. I am also doing a couple more quilts from this book...loving it! I don't know what struck me, but this seems urgent all of the sudden...you know what I mean when that quilting urge strikes. Remember to go visit Darcie and tell her Happy B-day! The great Celebration Nine Patch exchange!! and at last, ready to mail! Except for Nicolie, the last remaining person whose blocks are in the mail...I just need to put hers when they get here into each package, and they are off to the post office! I had NO IDEA what I was getting into. I will just say to make a long story short, this was a huge deal to undertake...I really respect you swap mamma's out there who do this all the time. Hurrah for you!! HI Y'all!! I am a computer goof...so I don't know how to make Debi's link work...but please see her here. She is hosting the most wonderful Fall into Fall Giveaway! 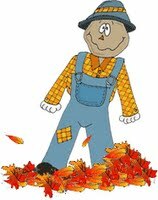 Well over 100 quilters are linked there, to her blog...just click on the scarecrow on her blog and see all the giveaways in progress. I am giving something away too...the jelly roll below. It is for Valentine's day! so you will be ready way ahead of time. It is the Moda Roll Flirtations. Good luck! All you need to do is leave me a comment on this post...that's it!! Here is the Jelly Roll...I love those pinks...hope you do too! This arrived for the nine patch exchange...this is so fun, it is a mother and daughter from Australia, Debbie and Norma...aren't their nine patches just gorgeous? And they sent candy ( I love this particular naughtiness against my diet), and a lovely card, and a large fun button, and a pretty stitcher's badge holder...and a wonderful calender, all about Australia! I loved opening this fun box...and it is just wonderful that mom/daughter can do this together. Thank you Debbie and Norma!! And just look at these gorgeous nine patches all the way from England! Aren't they just so pretty? I love Ailsa's color combination...she is a nurse too...thank you so very much, Ailsa!! I so appreciate you participating...please see her blog here. She is an awesome quilter and a knitter too! Attention all nine patch swappers!!! I just want to let you know, all the nine patch packages are addressed and ready to go...except for two swappers who have just sent their packages to me, and the packages are still in the mail to me. I am waiting for them, because I know you would want their nine patches. A very few people did not fulfill their promise to make nine patches...so I guess they miss out! Each swapper will get back those few patches they made for these people who did not participate after signing up...we each can just use these in our own quilts!! Please e-mail me if you have a question...I have notated whose blocks I received and whose I didn't up on the Nine patch swappers list on the right on the blog. Have a wonderful, Joyful day!! !